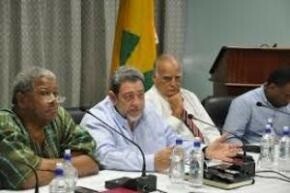 Prime Minister Dr. Ralph Gonsalves said Monday he would use his six month term as chairman of the Caribbean Community (CARICOM) grouping to deal with the deleterious effects climate change is having on the socio-economic future of the 15-member bloc. St. Vincent and the Grenadines, St. Lucia and Dominica are now emerging from the effects of a weather system that left a trail of death and destruction over the Christmas holidays. Caribbean countries have also had to deal with the annual hurricane season and in many cases, like in Haiti, unseasonal rains that cause widespread devastation. “The big issue…is global warming, climate change. We are having systems affecting us outside of the normal rainy season and the normal hurricane season,” he said making reference to the floods in April last year and the Christmas Eve rains that resulted in the deaths of nine people and hundreds of millions of dollars in damages here. “There are lots of monies which countries talk about for adaptation and mitigation to climate change. But I haven’t seen the money yet and we have to use our diplomacy as a region and we have to be aggressive with our climate change center in Belize. “In my term as chairman of CARICOM this is one of the issues which you will recall I said earlier on…I want dealt with during my term in a continued serious and structured way, (and it) has to deal with the deleterious effect of climate change and to get the requisite responses from the international community in relation to this matter”. Gonsalves told a news conference that the region does not contribute “anything to these man made weather systems, these problems with putting so much carbon dioxide in the atmosphere. “We are …on the front line,” he said, adding that “this is an issue which is big”. Gonsalves said that efforts were now underway to stage an international donors’ conference to help the three affected islands recover and rebuild their battered infrastructures. He said he had already received a letter from Antigua and Barbuda Prime Minister Baldwin Spencer, who is also chairman of the Organisation of Eastern Caribbean States (OECS), outlining plans for an international donors’ conference. “There is a letter which Baldwin sent to me which I have reviewed and make one or two slight alterations and suggestions, but we have to prepare for a donors’ conference well, maybe in March may be in February… but we have to prepare for it well so that we can get the donors to make pledges,” he said, recalling a similar conference had taken place to help Grenada after it was battered by a recent hurricane. “I know some of the donors came through and others did not, but at least we need to do that to lift the profile,” Gonsalves said. The St. Vincent and the Grenadines Prime Minister told reporters that an insurance scheme organized through the World Bank, to which all the Caribbean countries contribute, does not go far enough. “To the extent that the monies you get from the Catastrophic Relief Insurance System is fairly minimal, but of course every little bit helps,” he said. Gonsalves said he had already written to the leaders of several countries and was now waiting to see “what kind of grant assistance we can get because we really need grants preferably. “The World Bank will give soft loan monies, the CDB (Caribbean Development Bank) will give soft loan monies, the European Union will give grants, Venezuela will give grants, (and) Taiwan will give grants”. By caribbeanclimate in 5Cs in the News on January 9, 2014 .